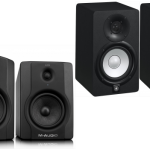 Even though we’ve covered shopping guides for most music and recording gear in the market these days, there’s still some other valuable additions you may need for your studio. We’re not talking “equipment”, either — how about furniture? 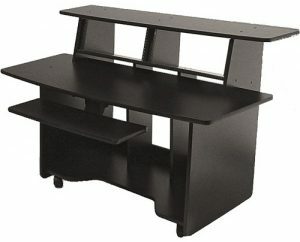 Back in the day, we remember getting by with our typical Ikea or other popular store-brand desks when we were first starting out; however, upgrading our desk not only helped keep our gear organized and safe, but saved us some time and improved the work flow greatly to get those ideas coming quicker than ever. Today we found a few studio desks worth looking at — how could we forget that we need something to keep all this gear on! 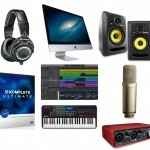 Especially if you’re building a home studio, we need to keep everything organized. With that being said, we found quite a few choices today to keep it a bit broad — do you have a bunch of gear, or perhaps just a simple controller or two? Price range – Furniture in general isn’t exactly cheap, and some of the best studio desks out there will cost a decent amount of money if you were looking to invest in a solid model. 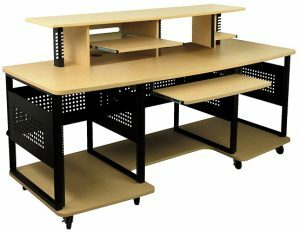 We found quite a few desks within different price ranges to help you out with options. Desk Size? If you already have your desired studio room picked out, or are currently looking to replace an existing desk, the size of your model will be important here. The more room the better of course, however we’ve seen many home and even semi-professional studios in different shapes and sizes so kept the choices broad in terms of size as well. How much gear? How many shelves, nooks, crannies, and extra little spots you need will be determined by how much gear you not only currently have to store, but what you envision owning in the future as well. What’s cool with studios is the fact that you can always add on later; however, we do love having our equipment consolidated as organized as possible (could just be our personal preference). Looks\build preference – Do you like wood finishes? Metal? Black, cherry, brown, maple, etc.? The make and finish will not only determine the overall look and aesthetics of your studio desk, but also say a lot about the longevity it will provide in terms of construction. 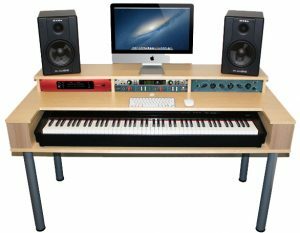 The following are the best options for music studio desks and what we’ve found after some pretty rigorous research. Of course, you can always just grab a cheaper, broad and common desk if it fits your intentions and needs. However, the following were the few desks particularly geared towards workstations for musicians, whether you record, mix, master or produce — let us know if you have any other ideas or feel we missed some desks worth looking at out there. To kick off our list, we have one of the best studio desks in the market today right here, especially if you’re looking for versatility and have numerous pieces of gear to keep at hand. As you can see in the photo, the nooks and crannies have some broad uses that you can fill in as you wish. Although it really depends on the musician in terms of what spot they’d like to place a specific piece of gear in since it’s subjective, you have dual 20-space racks, a 26 1/4″ slide-out keyboard shelf, a main tier big enough for a whopping 88-key keyboard, an 8-space rack, and dual 8-space CD holders. The upper tier can hold some more additional keyboards, MIDI controllers or synths you have, as well as a computer monitor or two. 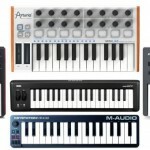 The additional smaller sliding tiers can be what you make of them — computer keyboards, audio interfaces, or perhaps a phantom power supply. There’s also a cable holder in the back to help with organization (which we’re terrible at keeping track of, so this is especially great for not only the look but safety of all of your wires and cables). In terms of the build and stability of the studio desk, you have a steel-frame construction with a nice maple wood finish. Check out the Studio RTA Producer Station for one of the best studio desks if you can afford it — we love the many capabilities it will provide the studio and help your work flow. Up next, we have a simpler solution as compared to the previous best studio desk pick, and although the price is a bit higher, the overall build and construction is a lot better in quality. This particular model by Omnirax has a desk surface that’s wide enough for many keyboards (yes, 88 keys are fine), controller surfaces and mixers as well. 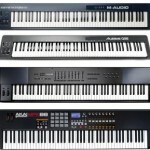 You have the needed computer keyboard sliding shelf right in your lap (we love having the keyboard in front of us above our computer keys as opposed to the side on a keyboard rack or something — it’s easier to switch between sounds in your DAW and what not). The top shelf is perfect for your studio monitors, computer screens and even a few more little surfaces if needed, and below you can fit the computer or subwoofer you have as well. The Omnirax Presto 4 is a bit simpler than others, but great for those who don’t need a huge desk and want something a bit more efficient to keep all of their gear handy. It’s also available in a few colors\wood finishes if you’re concerned with aesthetics. They do have a few other studio desk models if you were in need of a few more spots. One of our favorites is the Omnirax Force 36 (a lot more expensive but with a ton of more space and spots for gear). Here’s a little step down when it comes to studio desk size, however you’ll also be saving some money if you’re looking to go this route. As you can see in the photo, it isn’t a crazy and complex workstation for 10+ pieces of music equipment — we have some simplicity here for those looking for a simple solution. If you have the means for travel, this can also work in not only the studio but on stage (hence the brand name we suppose?) if you’re in need of a live performance workstation on top of it all. The slide-out keyboard tray is great for computer keyboard placement (highly recommended since again, we’ve tried to have our computer keyboard on the main tier with a MIDI keyboard on the side and we didn’t really like it). It won’t hold a 88-key keyboard but a 49 will suffice, and the desk holds up a total of 175 lbs. If you have a smaller computer monitor, you may also be able to get away with your studio monitors up top (but it’ll be a tight fit, otherwise if you don’t have a keyboard you can set them down on the main tier). 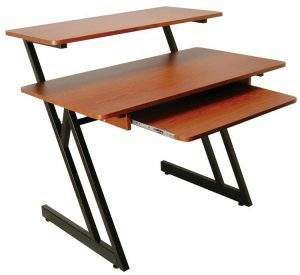 Don’t hesitate to grab the On Stage WS7500 if you wanted the best simple studio desk to fit a few pieces of gear, your computer keyboard and monitor to get to work quickly and efficiently. 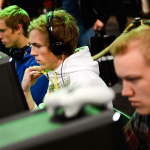 It can also serve as a little addition to your already existing setup on the side. You have a few color options, too! You can also check out their On Stage WS8700 for a bit more cash and some extra room\little features. Here we have a desk that’s a bit more broad in terms of exact applicability — however, we really liked a few of the features when it came to envisioning placing some studio equipment on it for a better work flow than other desks out there. This particular model is also one of the best budget-friendly studio desks we came across, so if you didn’t want to spend a ton of money on yours, here’s a recommended, cheaper solution. 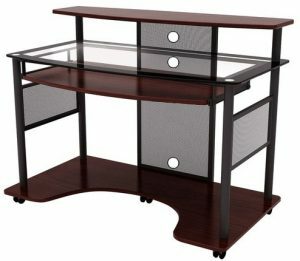 This one has some decent features aside from the nice cherry finish with black accent style, including a pull-out keyboard\mouse tray, decent sized (glass-finish) main tier, as well as an upper tier to keep the computer monitors (and a few other little surfaces or mixers on the side of them). 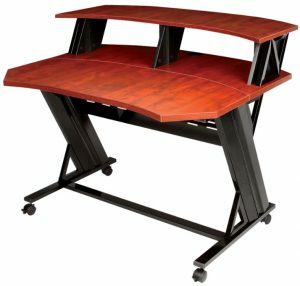 We like the Z-Line Designs Cyrus Workstation for those in need of a not only more broad type of studio desk, but an affordable one at the same time. 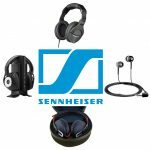 If you’ve read this far, you’re either not feeling our previous picks or still need something a bit more specific pertaining to your music setup. This studio desk is one of the best for those in need of an even smaller and simpler solution than others. You have a pretty wide work area for keyboards, synths and controllers, two 4-space racks, as well as an upper tier for monitors and what not. What stands out about this one is also the build — it’s very sturdy, has casters and locks to keep those wires tamed, as well as a cable port to keep them hidden. It weighs about 60 lbs. 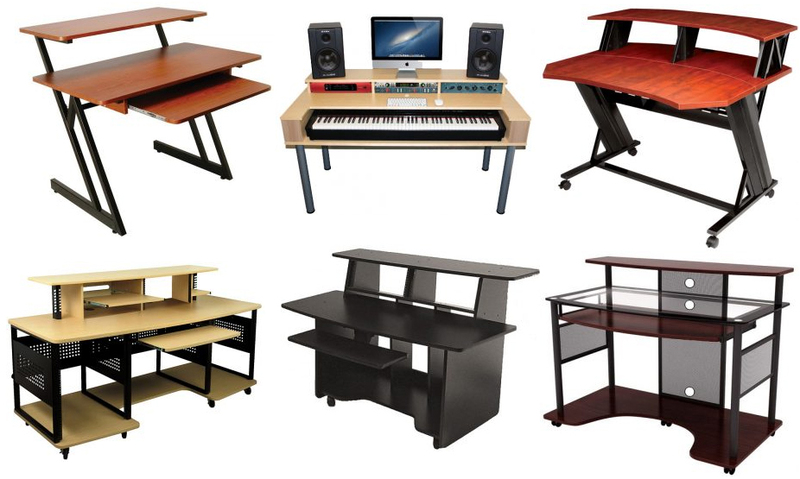 The Studio Trends 46″ Desk is great for musicians who keep in simple. Although a bit new to the game and not heavily as reviewed and rated as the others, we’re slowly falling in love with AZ Studio Workstations. They make some of the highest quality studio desks in the market, with the only downside really being the pretty hefty price-tags. Before you let that steer you away however, let’s see what this model (we chose this one out of a few of theirs in the series since it’ll appeal to the middle) brings us. You can a fit a wide 88 MIDI keyboard right in front of you, 6U rack spaces total, another very wide upper tier for computer monitors as well as studio monitors. The only problem we (again, our personal preference) see if the fact that your computer keyboard and mouse will have to be in front of you since it lacks a slide-out tray (we do know many who prefer this, anyways). Aside from the big space you’re getting here, the build is also very high-quality — maple melamine, likatre sides and aluminum finish legs. The AZ-R Midi Controller Desk is extremely solid if you have the money. You can also check out a few of their other studio desks here for different price-points, shapes and sizes.